The North Carolina transgender community is still living in fear nearly two and a half years after the “bathroom bill” passed, according to the ACLU and the lead plaintiff in a lawsuit against the state and the University of North Carolina (UNC). The only difference between now and then? House Bill 2 goes by a different name: HB142. HB2 was passed in March 2016. It eliminated legal protections for the LGBT community and mandated that individuals in government buildings use restrooms that corresponded to the gender on their birth certificate. It was promulgated to reverse a Charlotte ordinance that extended some rights to transgender people. A year later—under pressure from human rights advocates and an array of corporations, entertainers and national sports leagues and associations to repeal the bill—lawmakers passed HB142. The bill did repeal HB2, but it also preempted state agencies, boards and institutions, including UNC, from regulating access to bathrooms and prohibited local governments from enacting anti-discrimination ordinances over private employment practices or access to bathrooms. Vivek Suri, an attorney for UNC, and Stephen Schwartz, an attorney representing GOP legislative leaders Senate President Pro Tem Phil Berger and House Speaker Tim Moore, disagreed. Schwartz argued that HB142 was a procedural bill that no longer harmed transgender individuals and said it should be dismissed for lack of standing. “This is ultimately trying to blow up a complex political compromise and achieve a political victory plaintiffs could not achieve through the political process,” he said. He suggested that even if HB142 was repealed, there would still be trespass law, which is what the plaintiffs’ arguments were rooted in. U.S. District Court Judge Thomas Schroeder, a George W. Bush appointee, had several questions about trespassing and who could interpret trespass laws. “Nobody in this case can control how trespass law is enforced,” Schwartz responded. He argued further that the political process set up by HB142 treats everyone the same way — by forcing them to go to the General Assembly to pass laws whether they are for or against anti-discrimination ordinances. “It’s worth bearing in mind that there isn’t a one-way ratchet in this case,” he added. Suri told Schroeder that UNC has no power to interpret state law, meaning they also have no authorization to enforce HB142. “With or without 142, questions still arise,” he said, adding that without the legislation, it gives entities more power to exclude because they could push a discrimination ordinance. Prompted by Schroeder’s questions, some of Suri’s argument also touched on trespass laws and who (e.g. campus or local police) could enforce them. Schroeder gave Suri a hypothetical question to help clarify what he was trying to understand: If a trans student wishes to be housed in a dorm and then wants to use the showers correlating to their gender identity, what does HB142 allow or prohibit? “It preempts the university from punishing the student, but it also preempts the ability of the university to say, ‘Yes, it’s OK to use this shower,’” Suri said. Suri’s and Schwartz’s arguments set Schroeder up to pepper Strangio with a list of questions. “For now over a year, [UNC] will not let Carcaño know where he can use the bathroom,” Strangio told the court. Schroeder immediately jumped in with questions about the definitions of HB2 versus HB142 and said he was “at a loss” about how the plaintiffs were still injured by the latter. Strangio said Section 2 of HB142 prevents plaintiffs from having any legal authority to enter a restroom. “[Before HB2], certainly they were allowed to negotiate access,” he said. He added a short time later that he believed HB142 prohibits every aspect of access and that the injury is twofold — clients have to alter their behavior because of the replacement law and have restricted restroom use. Schroeder asked if he struck HB142 and HB2 down, what he characterized as “a total win” for plaintiffs, where Strangio’s clients would be. He responded that they would be back to their lives. Schroeder asked again how HB142 was causing injury. “He understandably has concerns,” Strangio said. He added that Carcaño can’t get authorization to use the bathroom at work and that other individual clients have alleged they can’t use the restrooms. Schroeder continued asking question after question about how specifically HB142 harmed the plaintiffs in the case. He also asked about their perceived risk in just using a bathroom matching their gender identity. Although Strangio is not arguing this point for the sake of the case — he said that what Suri told the court about not being able to regulate bathroom access wasn’t entirely true in practice. By maintaining men’s and women’s bathrooms, he said, UNC is regulating bathroom access. “It highlights that, read literally, HB142 cannot be squared with what’s happening on the ground,” he said. “And they deserve to have that,” Schroeder added. 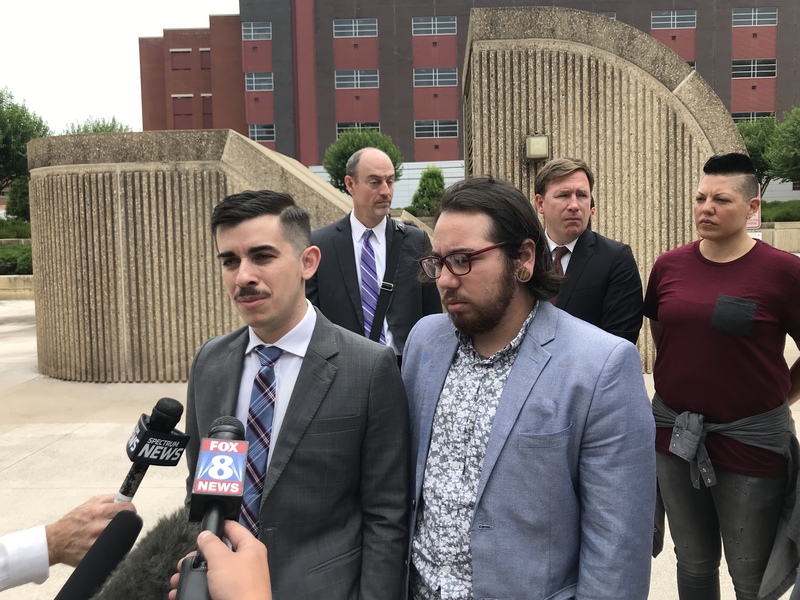 Schwartz and Suri argued later that Carcaño’s “inability to get a permission slip” was not enough to return the situation to where it was under HB2. Suri also argued that UNC was not responsible for causing injury because it was state lawmakers who created the barrier that prevents it from giving authority to Carcaño to use the bathroom he identifies with. Strangio said it’s not just the lawmakers passing the law who are responsible, but also those enforcing it. During Monday’s hearing, Carcaño was surrounded by supporters, including Sara Ramirez, an actress known for her LGBTQ advocacy and her former role as “Callie Torres” on Grey’s Anatomy. Toward the end of the hearing, Ramirez rubbed Carcaño’s back to comfort him as they waited for Schroeder to render a decision. Until then, Schroeder won’t take up a proposed consent decree in the case with Gov. Roy Cooper ensuring transgender individuals have access to executive branch agency restrooms that match their gender identity. In the meantime, Carcaño and other transgender community members say they’ll keep waiting for the same rights as others.